At the end of college, my boyfriend and I landed exciting jobs in Beijing. The only problem was that we had a yearlong lease on our college apartment with nine more months left on it. When we couldn't find a subletter, we ditched and hoped for the best. Bad idea. When the landlord stopped receiving rent checks, he threatened to report us to a collections agency and to the credit bureaus. We ended up negotiating a partial payment, and we learned a valuable lesson: You can't run away from what you owe. You're off to live in the jungles of Tropicanaland, where the only currency accepted is the cowrie shell. So why would you need those plastic credit cards that have to be paid in U.S. dollars? Keep them — especially the ones you've held longest — because the age of your credit accounts is a factor in your credit rating. Imagine you had just one credit card. If you have had that card for 12 years, close it when moving abroad for three years, then come home and have to open a new account, your average account age just went from 12 to zero. That will hurt your credit score. If you keep it open while you're gone, you'll instead come home to an average account age of 15. Another way that keeping your credit cards open benefits your credit score: It improves your credit utilization ratio, which calculates the percent of available credit that you're using. The higher this ratio, the more negatively it will impact your credit score. If your cards are paid off, and you leave them open, the amount of available credit you have increases — raising your credit score. To keep your payment track record going and to prevent an account from being considered inactive, find some regular expenses to set up on autopay. Maybe you still belong to a U.S. professional organization that you pay dues to, or want to support your favorite charity with an annual gift. Of course, in order to pay for these charges, you'll probably also need to keep a U.S. checking account open and funded. When I lived abroad, I had to rely on my mother to open my mail and make sure any charges got paid. This could get embarrassing, like the time my mom asked why I was spending hundreds at a place called "Casino." I had to explain that this was really, truly the name of a French grocery store. Nowadays, if you are living in a location with unfettered internet access, you may be able to handle your business without stateside help. Before you go overseas, establish online access to your checking and credit accounts. This should allow you to not only pay your bills remotely, but also monitor your accounts for fees, fraud, and overdrafts — other potential causes of credit score damage. You can even choose to have your credit card bill paid out of your checking account automatically, if you're confident that the funds there will cover the bills. It's always a good idea to inform banks and creditors when you're traveling, but even more so if you are moving away long term. They may have special hotlines for contacting them if you need help overseas. And knowing where you live could help your card issuer catch fraud more easily. 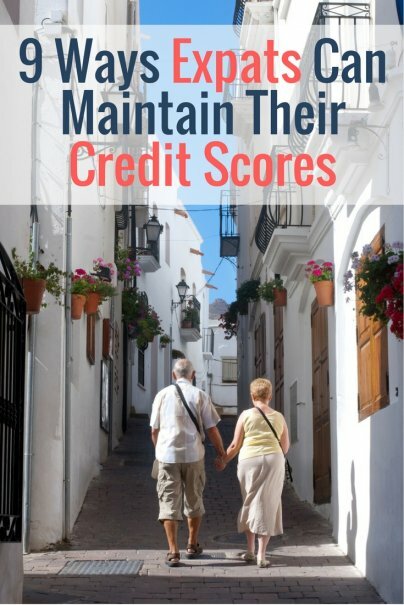 Seasoned expats advise this for a number of credit-related reasons. Some banks, credit cards, and investment accounts might not be set up to do business with a foreign address. If for some reason you want to open a new account, you'll need a domestic address to do so. You can use a friend or relative's address or a mailbox service. Either way, make sure you are able to actually read any correspondence you get in a timely manner. That way, if a bank or credit account sends you a warning notice, you'll know right away and avoid credit-damaging mistakes. Fortunately, there are now services that will open and scan all mail for you, in case you don't have anyone you trust at home to do this. If you don't pay money you owe to the U.S. Internal Revenue Service, you could end up with a tax lien sitting on your credit report for the next seven to 10 years — and good luck getting any credit in the U.S. while that is sitting there stinking things up. You may or may not owe taxes while you are living and working abroad, but you should still look into whether you need to file a tax return. You can claim a credit for any taxes you pay to a foreign government, which may eliminate your tax burden to the IRS. However, you'll still owe for any taxable U.S. investment gains or income such as rent payments on a U.S. property you own. It's especially important to report foreign bank and investment accounts to the IRS. Some expats advise hiring an accountant who specializes in Americans living abroad to file your tax return. If your only use of credit during a decade overseas was credit cards, you may have saved your credit profile from oblivion, but it still won't be as great as it might have been if you'd stayed home. That's because about 10 percent of your credit score is based on having a healthy mix of credit types: not just "revolving accounts" like credit cards, but also installment loans such as a car loan or a mortgage. Get back on the credit horse when you get home, and after making a series of on-time installment loan payments, you should see your score improve.